What is sales force effectiveness? Sales force effectiveness is in the eye of the beholder. An effective sales process for one company will not necessarily be the right one for another firm. expand product cross-selling or up-selling, etc. After you define your corporate goal, you can then establish the most effective processes to achieve those results. Your sales effectiveness will relate to the processes and tasks that get you the sales output you desire. Don’t confuse sales force efficiency and sales force effectiveness. Sales efficiency refers to a person (or team’s) ability to complete a task with a minimal amount of energy, efforts, money, or time. It speaks to how well a person completes a task. Sales effectiveness refers to both sales output and strategic goals. With SFE, you focus on the results and the process. While sales efficiency means doing things right, sales effectiveness means doing the right things well. As mentioned above, your definition of SFE must align with your company’s strategy. For a simple formula, consider the following. Sales Effectiveness = average strategic sales* output. For example, if you are merging two sales teams due to an acquisition, you could measure the processes that improve cross-selling. If you want to move into a new market, you could measure sales activities related to getting into that market. Once you define your SFE targets, you need to measure results. You should measure the performance of the sales team and individual salespeople. The average of the sales team’s target metrics gives you a holistic snapshot of your team’s performance. The measurement for each individual identifies where you can improve. In the chart above, the graph with the Ostrich shows the most critical case where the entire sale team’s EBITDA is negative. The Elephant (the authors say this is the most typical) depicts the state where the entire sales group’s EBITDA is just marginally profitable. 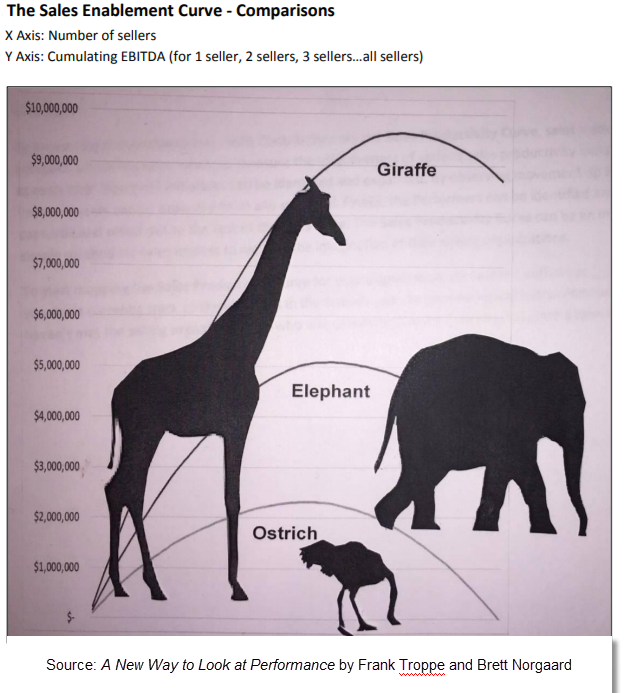 Finally, the holy grail of sales performance curves, the Giraffe, shows a sales team with a very profitable EBITDA. The Troppe and Norgaard paper also provides information on tracking sales performance for individual salespeople. Their research shows that in many cases 20% of the sales team will provide 100% of the EBITDA. They explain that the other 80% actually subtract from the total. In analyzing the performance of each salesperson, you must measure what is and what is not working. By identifying that is not working, you can see the best improvement path. For example, you may want to measure not only deals won; but also deals lost. In analyzing the lost deals, you will find the greatest opportunities to improve your sales team’s total sales. The first step in improving your sales force effectiveness is capturing your current state. If you are just starting to measure sales effectiveness, you need to establish an initial benchmark. You can conduct an internal review of your entire sales force. Pay special attention to the top and bottom sale performers. Your analysis should focus on the effectiveness measures related to your corporate goals. For example, if you are trying to improve cross-selling, analyze the processes of the top-performing individuals and the underperformers at this task. From this internal review, you can develop a set of best practices for your sales process. Companies can use their best practices as a benchmark for evaluating the sales effectiveness of each individual. For example, are the higher performers consistently scheduling more product demos? InsideSales.com reports that the two main sales skills most companies track are lead generation and closing skills. 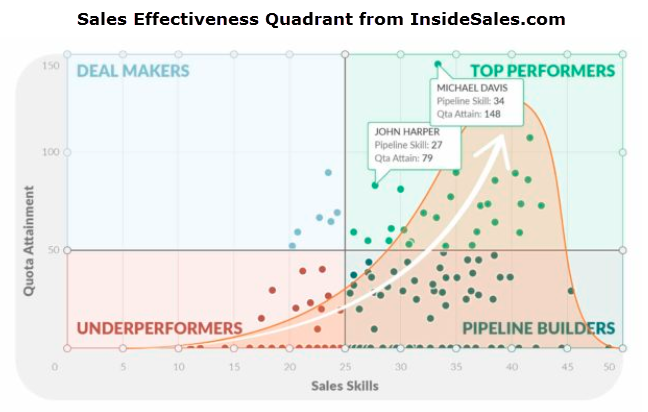 InsideSales.com developed a quadrant to depict how individuals fall in the spectrum of these skills. To read more about the InsideSales.com sales effectiveness quadrant, visit this link. Organizations can use these metrics to determine which sales reps need new training, coaching or reassignment. You can also compare your sales team’s performance to industry leaders. BSK helps companies benchmark the performance of their salespeople with industry leaders. Our tools enable companies to compare the performance of their individual salespeople with industry peers in 21 sales core competencies. We use data from more than 1,800,000 salespeople. Ready to compare your salespeople to the other salespeople we have assessed, and/or the salespeople in your industry? Include your salespeople in the data, FOR FREE by clicking on this link. Our next Sales Effectiveness post will discuss strategies for improving your sales team’s performance.